Food lovers, design enthusiasts and kitchen specialists from from Montreal. We share our thoughts about what sparks our interest with everything related to design, trends and food! 15 YEARS, A KITCHEN & A TEAM OF EXPERTS! As promised, today I unveil our new kitchen showcase and I take this opportunity to slip a few words on our passion for cooking! THE ANNIVERSARY KITCHEN IS SHAPING UP! In my previous post, I spoke about the importance of finding inspiration for our project, a contemporary kitchen with an old-fashioned flavour and the material that allows us to reach our goal. 15 YEARS: WE HAD TO CELEBRATE THAT! 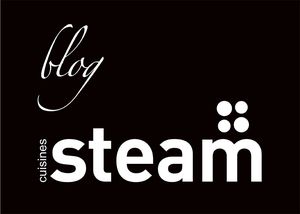 Cuisines Steam is celebrating its 15th anniversary this year. For the occasion, we want to get out of the ordinary and offer a kitchen full of originality and manufacturing challenges. This September, I had the good fortune of being invited to visit the Sub Zero & Wolf factories in Wisconsin. ALL THE SECRETS BEHIND THE KITCHEN OF A CULINARY BLOGGER! It was last November that Christelle approached Cuisines Steam to collaborate in the development of her future kitchen.